we make and how our customers use them to move and experience life, but our vehicles are only one part of the overall equation of accessibility. Sadly, a portion of people in wheelchairs are faced with an issue far before the van comes into play: stairs into their home. Ramps are a requirement for some to be able to enter and exit their house at will, and not every home has a ramp. This is where SAWs (Servants At Work, Inc.) comes in. 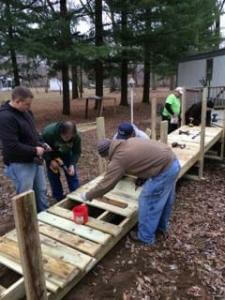 SAWs is a non-profit group based in Indianapolis that places every resource at their disposal into building ramps for those who need them. SAWs operates entirely through volunteers and serves the entire state of Indiana. When word of a person in need reaches them, they send out a scout, assemble a team from the community, and get to work. BraunAbility is based in the Northern region of Indiana, and we had the opportunity to assist with two SAWs builds in our area. Members of manufacturing, purchasing, marketing, HR, and more came out to help on two different Saturday mornings. The builds were managed and ran by SAWs team members. "We know how important mobility is for anyone's quality of life, and that starts at the home," said Megan Wegner, brand manager for BraunAbility. "This was a great chance to come together as a team and really make a simple and immediate impact on someone's life." Construct high quality removable and reusable wooden wheelchair ramps for individuals in the community who cannot otherwise afford to free themselves from the imprisonment of their own homes. Provide volunteers with a fulfilling opportunity to serve those who are less fortunate. Demonstrate God's love and live His desire that we help each other and exemplify Jesus Christ. We were honored to be able to partner with such a powerful force for accessibility in our own neighborhood. To check out what SAWs has going on near you, or just find out more information, you can find their home page here.